Do you dread going into you garage to look for tools or some other item you stored away? Do you dislike having to leave your car parked outside the garage because it so cluttered it will not fit? Whether it is making space for your car or making it easy to find stored items, check out these great tips to get your garage better organized. Add Shelving: To increase storage space in the garage, install shelves on the walls. You can build your own or select from a variety of different styles to accommodate all the items taking up floor space. Add a Pegboard: Pegboards are great to attach to the wall for hanging up small tools. You can organize screwdrivers, paint brushes, hammers and other such tools. You can even find “mini” bins for putting loose screws and nails into that attach right to the holes in the pegboard. Store Bikes Overhead: Get some large bike hooks that you can screw into a beam on the ceiling of the garage. Hanging up bikes gets them off the floor and helps make room for vehicles. 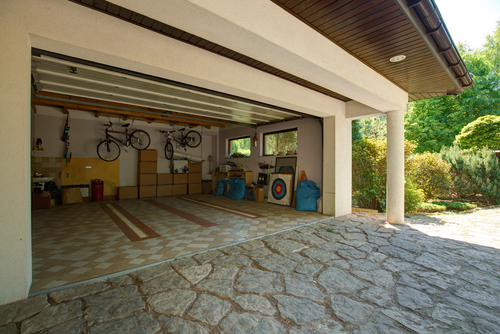 Add Overhead Storage: The ceiling in the garage has a lot of unused space that is perfect for storage. There are several storage solutions you could consider, even one that uses open rails that you can slide plastic storage tubs in and out of easily. Hang Larger Tools on the Walls: You can use bike hooks, large nails, or other such items to create areas on the wall where you can hang up tools. Another great option to keep shovels in place when hung up is to use a small piece of PVC at the bottom to secure the handle to the wall. Get Clear Stackable Storage Tubs: Clear storage tubs are great to use because you can see what is inside when you need to get something out. You can place these on shelves or stack them on top of each other in a corner. Get a Storage Shed: If you have a riding lawn mower, snow blower, and other large outdoor lawn and garden equipment, consider investing in a storage shed to free up space inside the garage. Once your garage is organized and looks great, you may want to get a new garage door installed to complement your great looking garage. Modern garage doors have many new features, like insulation so you can use your garage year round for other things besides parking your vehicles. For instance, some people like to use their garage for arts and crafts projects or as their own private fitness workout area. Feel free to explore the wide assortment of garage doors available from Richards-Wilcox Doors or try our free Design-A-Door App. Do not hesitate to contact us directly for further assistance and help selecting the best garage door for your newly organized garage by calling (800) 667-1572 today!